Every Gujarati thali has one common sabzi in it, Batata Nu Shaak. This recipe prepares traditional Gujarati batata nu rasa valu shaak, which can be paired up with masala puri or thepla for complete meal. 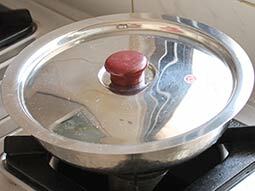 Heat oil in a heavy bottomed pan or kadai. Add mustard seeds; when they begin to crackle, add cumin seeds and asafoetida followed by green chilli-ginger paste. Stir and mix well. 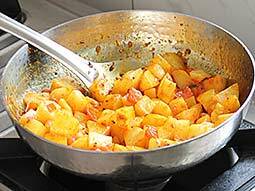 Add cubed potatoes and sauté for 3-4 minutes. Add chopped tomatoes, salt and sugar and sauté for 3 minutes. Add red chilli powder and turmeric powder and sauté for 1 minute. 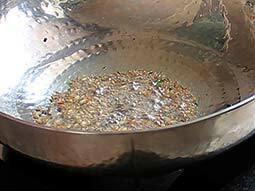 Add 1¼ cups water and let mixture boil over medium flame. 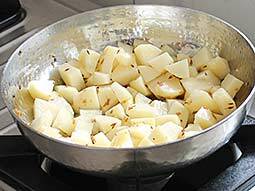 When boils, cook covered on medium to low flame until potatoes are cooked, stir every 4-5 minutes. Add cumin-coriander powder, mix well. Turn off the heat. Transfer it to a serving bowl, garnish with fresh coriander leaves and serve. 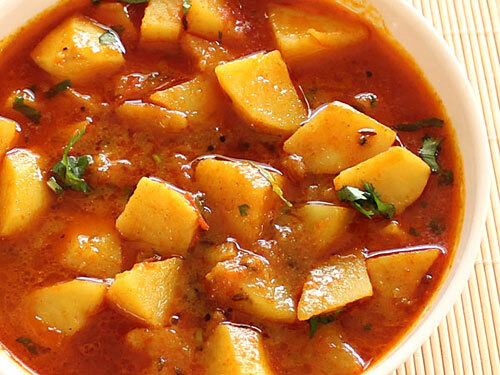 You can also use unpeeled potatoes to make this Gujarati potato curry. Add 1 teaspoon crushed garlic to make it a bit spicy and aromatic. Gujaratis like little sugar in all sabzis and this recipe is no exception. You can adjust the amount of sugar according to your taste or completely avoid it if you don’t like mild sweet after taste. 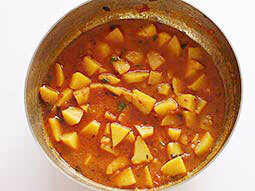 Serving Ideas: Batata nu shaak can be served with hot phulka roti or chapatis for lunch. 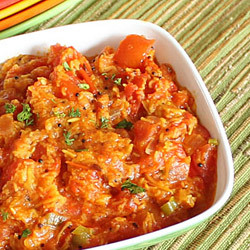 Many prefer to serve it with steamed rice, papad and curd. My vegetable kolhapuri turn out good by following your guide step by step. Do you use black mustard seeds? Also instead of green chili-ginger paste, can you use 1 green chili and an inch of ginger- is this the same? Response: Yes Priya, black mustard seeds are used and you can use 1 green chilli and an inch of ginger(or more or less as per your taste) instead of green chilli ginger paste. Simple and straightforward - results in a very tasty dish. Tasty curry made with ease and available ingredients. Hello, I made this recipe and it turned out well.The only difference was in the water level after cooking. I had to cook it uncovered for a few minutes for water absorption. It was too watery in the beginning. It was awesome dish and thank you. Excellent recipe with step by step instructions and pictures. I have made this veg so many times and my kids love it. I am dum-alo masala, garlic and kasuri methI. Do you boil the potatoes and then cube them or is this uncooked potatoes then they will cook while cooking? 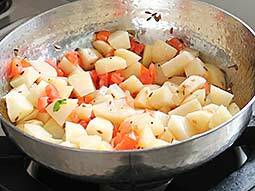 Response: Hi Ravi, uncooked potatoes are used in this recipe. It looked watery for a bit but after I cooked it looked better. I made this for my mom when she was at work and I forgot to bring her food home so I decided why not make Indian food myself. She loved it. Thank you for this recipe. I have tried this is one of the vegetarian gujarati thali. I am pakistani, and love this recipe ! Response: Happy to hear that you liked the recipe. I'm trying the recipe right now and it looks watery... plus I'm cooking in tefal vessel so how much time it needs to cook in it? Response: Hi Priyanka, if the potato is cooked and curry looks watery, cook it uncovered for few more minutes until you get the desired consistency of gravy. 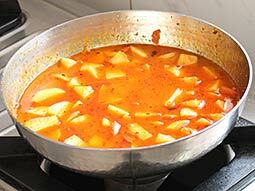 Time required to cook depends on the thickness of the vessel and quantity of the curry. I have a question. In this recipe, coriander powder is added towards the end. Wouldn't it impart a raw smell? Can we just add it while adding the chilli powder? Response: Hi Shifa, coriander powder is added towards the end in most of the Gujarati curry recipes to enhance the flavor. If you do not like raw smell of coriander powder, either you can add it while adding other spices (like turmeric powder and red chilli powder) or you can skip it. It was simply delightful & so tasty goes very well with chappattis. Turned out exactly how I wanted. Did add little kasuri methi though. Response: Thanks for trying the recipe. Yes, you can add kasuri methi to give it a punjabi touch. I made it for my kids and they loved it. I will follow receipe more carefully and add less ginger next time. Response: Thanks jignesh for trying the recipe. You can increase or decrease the amount of ginger, green chilli and red chilli powder according to your taste to make it more or less spicy. This is a wonderful recipe which my whole family ate with delight!